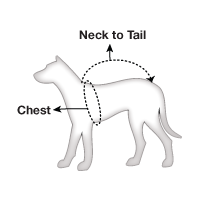 Sizing measurements provided are a range for the pet who will be wearing the costume, NOT measurements of the costume itself. We recommend that you buy one size larger if you are unsure of your pets length or if it is uniquely proportioned. Robin Pet Costume includes shirt with detachable cape and eye mask. This is an officially licensed DC Comics product.